Evoke the flavors of the Mediterranean with this fresh and easy chicken pesto pasta. 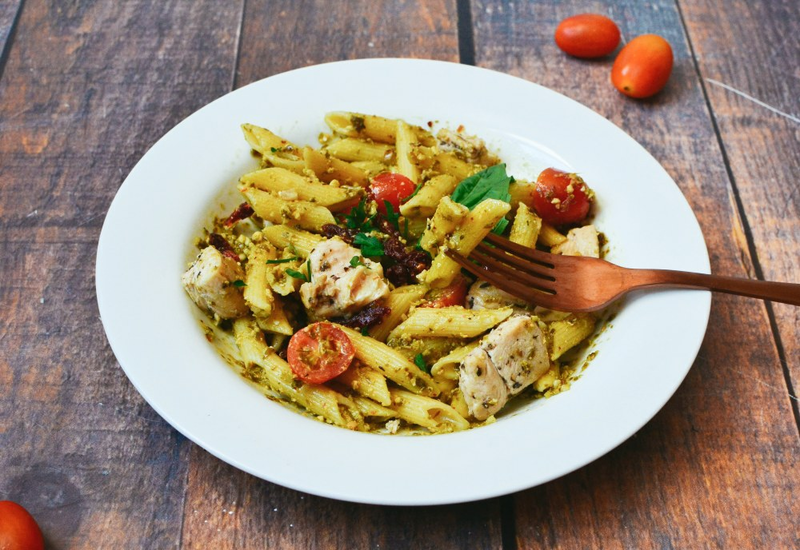 It's easy and delicious— chicken breasts are lightly sautéed with basil and garlic, then tossed with fresh cherry tomatoes, penne and prepared pesto. Oil-packed sun-dried tomatoes add tons of flavor and texture. This Italian dish takes less than half an hour to prepare, and can be enjoyed hot or cold, making it perfect for easy weeknight dinners and daytime picnics alike. You can find good cherry tomatoes year-round, so it's also a great way to bring the bright flavors of summer into your kitchen even in the dead of winter. Avocado oil has a higher smoke point than olive oil, which means that easily-burning garlic is less likely to char. If you don't have that, use canola, vegetable or coconut oil. Olive oil has a low smoke point, so it's better for finishing dishes or cooking over low heat. Per Serving: 559 calories; 33g fat; 26.5g carbohydrates; 40g protein; 93mg cholesterol; 750mg sodium. This pesto penne pasta was delicious! Loved the sun-dried tomatoes mixed with the cherry tomatoes. This recipe is good enough to eat with our without chicken. I also used the prepared basil pesto recipe on this site. Yummy! I love pasta and this pesto penne version is certainly no exception. This recipe was quick, easy, and delicious. I can eat it warm or cold. Simple recipe! What I realized though, is that it works way better with homemade pesto, not the jarred stuff. I used spaghetti instead of penne and it was delicious. I left out the sun-dried tomatoes but added more diced roma toatmoes. Great with chicken or shrimp! This was perfect sans the sun-dried tomatoes. I used extra garlic, because you can never have too much garlic. I also added some shaved parm on top, so yummy. Great pasta recipe that's not "spaghetti".